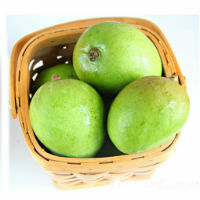 In India, green mango is used as a medicine for various gastro-intestinal, bilious and blood disorders. Eating one or two tender mangoes, in which the seed is not fully formed, along with salt and honey is a very effective medicine for diarrhoea, dysentery, piles, morning sickness, chronic dyspepsia, indigestion, constipation, etc. Eating a fresh green mango baked in hot ash daily once or twice is a sure preventive remedy for sun-stroke. Eating raw mango with salt quenches thirst and prevents loss of sodium chloride and iron during summer due to excessive sweating. It tones up the body and helps one to tolerate the excessive heat. Peeled fruit is applied on the eye to cure burning hot sensation due to sun glare.